I haven't done one of these in a while, so here's a random rundown of televised entertainment I've been watching lately! I'm currently rushing through a bunch of Netflix exclusives, in a stupid quest to finish all of them before HBO Now is released so I can cancel my Netflix subscription and switch to that in time for Game of Thrones / Silicon Valley. Some shows are better than others. At the top of the list, Unbreakable Kimmy Schmidt is fantastically funny. It manages to be really surprising and engaging and clever. I was pretty impressed at how they were able to develop an actual arc over the course of the season... I thought that they were just going to use their strong premise and cast for a typical sitcom structure, but it evolves into this really great overarching story. I'm still a bit baffled why NBC let this one go, it would have easily been the best comedy on the network. Speaking of great comedies let go by NBC: The Yahoo! TV season of Community has been really good so far. It got off to a strong start, evoking the show's typical love of meta-referential humor thanks to Abed's musing over spin-offs and the study group's disparate levels of attachment to Shirley's and Pierce's vacant chairs. I'd been bracing myself for lowered production values with the jump from network television, but it's actually felt pretty much the same as before; the opening frisbee disaster seems like vintage Community shenanigans. And as a final bonus, I adore Paget and she's been terrific in this. Archer's also having a very strong season. I'd been bummed by them pressing the reset switch at the end of the previous season, but the show's story and mythology is still continuing to evolve, and the character relationships provide their own form of dynamism. It's great fun, and they continue to outdo themselves in animation quality with each new year. The show also has probably the best-calibrated sense of any show regarding when to repeat their catchphrases and when to give it a rest. Moving on to dramas, Better Call Saul has been fantastic. I'm a big Bob Odenkirk fan and was on board for whatever happened. It's ended up being a really interesting alternative to Breaking Bad. BB was a master at propulsive serial storytelling: you were always wondering what was going to happen next, how Walt would get out of his current jam. Obviously, since BCS is a prequel, we already know where the character is going to end up, but there ends up being much more ambiguity in this show than the original. It moves forwards and backwards in time, giving us tantalizing glimpses of different moments and revealing character glimpses. When watching this show, I usually don't ask myself "What will happen next? "; instead I'm wondering why characters are relating to each other the way they are, what reasons people have for the actions they take. The payoff to these questions is slow, and many are still outstanding, but the revelations we've gotten so far have been incredibly satisfying. I'm really looking forward to what happens in the rest of this show's run. I've also begun tearing through Orange Is the New Black and have been really enjoying it. This show also feels pretty loose and has lots of digressions, particularly when it flashes back to the pre-prison lives of its inmates, but in this case that seems to enhance the show: it highlights the vast ensemble's diverse experiences, and also emphasizes the basic randomness of events. We're regularly reminded that these women aren't particularly bad or dangerous; they made mistakes, and were unlucky enough to get caught. There's a ton I like about this show, and perhaps I'll give it its own post later, but for now I'll mention how much I appreciate the complexity of its characters. Someone like Caputo is a great example: he's personally sleazy, and can be really capricious; but he's also a reformer who seems to genuinely want the prison to be run well (although, granted, there's some self-advancement attached to this). On the other hand, Healy is much friendlier than most of the staff and seems like a quintessential nice guy; but he's deeply homophobic and can be extremely petty. What I like about this show is that it isn't just a matter of "This character is good fooled you! no they're bad"; it isn't afraid to make a character sympathetic, then show them being really crass, then show them demonstrating compassion. Every character is a collection of good and bad, just like all of us in the real world. Hm... I think that's about all that I've watched lately (other than viewing this amazing mashup of Taylor Swift and Nine Inch Nails approximately 50 times over the past two months and Panic Switch another two dozen). I'm definitely looking forward to trying out HBO Now. Netflix has been good and all, but it's been months since I found a movie on there that I actually wanted to watch, and if it weren't for TV shows I would have canceled it long ago. Between Game of Thrones, Silicon Valley, Veep, and the new movies (including Going Clear) and maybe even that Vice news show, I should have plenty of good entertainment in my future. 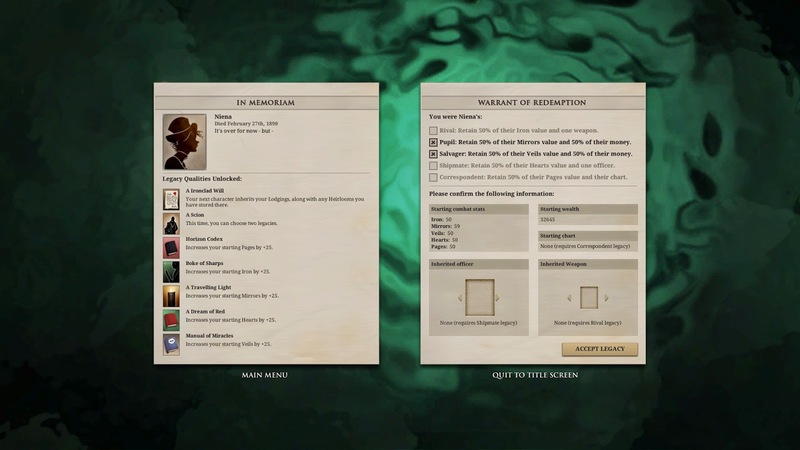 Andrew reminded me that I never posted my final experiences on Sunless Sea. So, here they are! As previously noted, I had started to pay attention to the unlockable Legacies. They're a bit like achievements, and come with the advantage of an extra +25 in a starting stat for all future characters. A few of them require ending the game, but others can be acquired in the midst of your voyages. I plotted out a "leveling up" run that would efficiently unlock all remaining Legacies for me, putting me in a strong position for any future ventures. One of these was fairly straightforward, if obtuse: finish delivering Sphinxstone to the Bazaar without having picked a background for your character. I'm very impressed with whoever figured out that solution on their own. In retrospect it makes at least some sense: the destination for the sphinxstone varies depending on your background, and an unknown background translates to St. Joshua's Shrine. Still, I'd always taken it to the Grand Geode, so I never would have stumbled across that solution without the wiki's help. The next, A Dream of Red, can be gotten in two ways. I'd hoped to take the Scarred Sister up to the Surface, but in this game I failed my Mirrors roll when her house burned down and she died before I could rescue her. Fortunately, there's a fallback, which requires completing the Acolyte's questline. 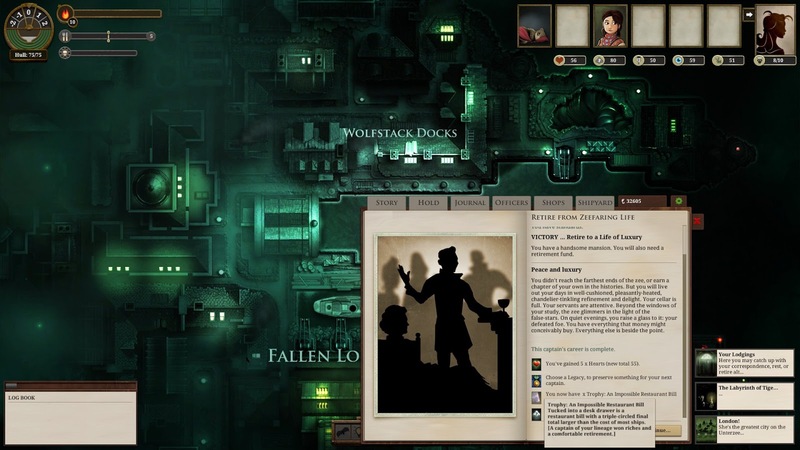 Thanks to my linked Fallen London account I always start out with a Soothe & Cooper longbox to kick this off, and in this game Station III was located conveniently enough where I could swing by it at the start and end of every voyage. In previous games I had lied to protect her, and I really liked how the story ended after showing her the truth and comforting her. I'd already picked up a Legacy in my previous game from the fantastic Empire of Hands story. That left two challenging-but-feasible ones for the complete set. One would require working with the Anarchists to destroy London. That doesn't technically end the game, but it does expel you from the City and bar you from any Admiralty work. The next requires finishing the Merchant Venturer's storyline. In the past, I've usually gotten stuck on steps like "Collect 7 Hunting Trophies." They're entirely random, though, and in this game I really lucked out since nearly everything could be bought right at Wolfstack: it's even still (slightly) profitable. I got to the last step, which would require upgrading to a larger vessel like the Merchant ship. So, I started making Sunlight runs up to the Surface in my tramp steamer while working with the Anarchists. This was the only game where I remained on good terms with the Blind Bruiser, who gives really good prices for Sunlight and returns your boxes. He does require periodic services from you, though, so I would interrupt my trips to Venice with occasional journeys to Khan's Heart or other faraway locations. Along the way, I earned a good number of echoes. This was just before Failbetter added some penalties for carrying Sunlight, and I understand it's become less viable now, but I got to something like 6500 by the time I wrapped up the Anarchists' work. I cut my ties with the Admiralty, liquidated my remaining assets with the Alarming Scholar (Tales of Terror, a Searing Enigma, etc. ), picked up the merchant cruiser, loaded it up with the Merchant Venturer's supplies, then sailed North. We made it to Avid Horizon after evading Mount Nomad. It was my first experience with any ship other than the Steamer, and I had been a bit worried that it would be unbearably slow, but it actually felt like it was going about the same speed. That might be because I had upgraded engines already on the steamer; I'm still not totally clear on how speed works, but you might need a minimum power level to drive a certain mass. In the Horizon, we prepared ourselves at the Gate, then prepared to step through, which required only a Searing Enigma.... oh, crap! There had been no advance warning of needing this item, and I had already sold the only spare one I had. I cursed myself for not extensively reading every aspect of the wiki before making any major decisions in this game. Enigmas aren't just expensive; they're also one of the hardest items to get. I had already exhausted the easier sources, like Nuncio and the Tomb of the Emperor. 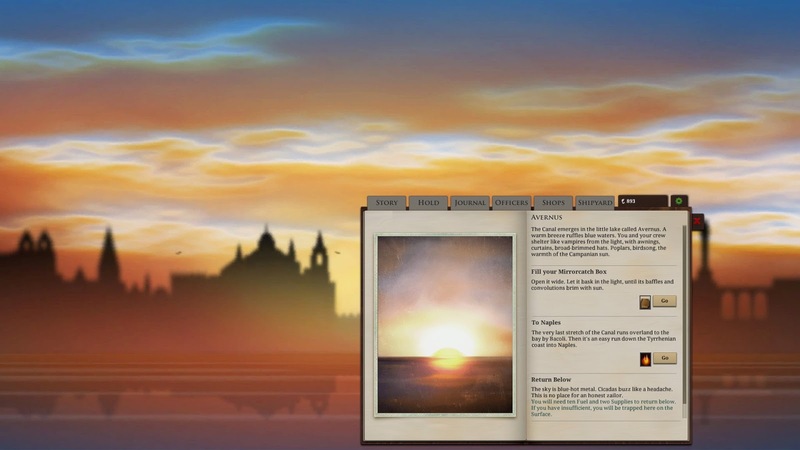 I wracked my brain thinking of other solutions, before remembering that you can get an Enigma at the end of the Presbyterate Adventuress's story. I'd been really bummed the first time I did this, since I hate losing companions, but by this point I would have gladly sold my entire crew and my own mother for a single delicious enigma. For some reason I hadn't even recruited the Adventuress in this game, so I did a few more Sunlight-snatching trips while waiting for her to show up in London. Fortunately, since I had done her quest before, I had a better idea of what stuff I would need on hand to complete it. The first time around I had spent a lot of time and money to open up the shops in Khan's Heart and pick up Romantic Literature; having done Empire of Hands since then, though, I knew that trading with the apes would be a far cheaper and easier affair. 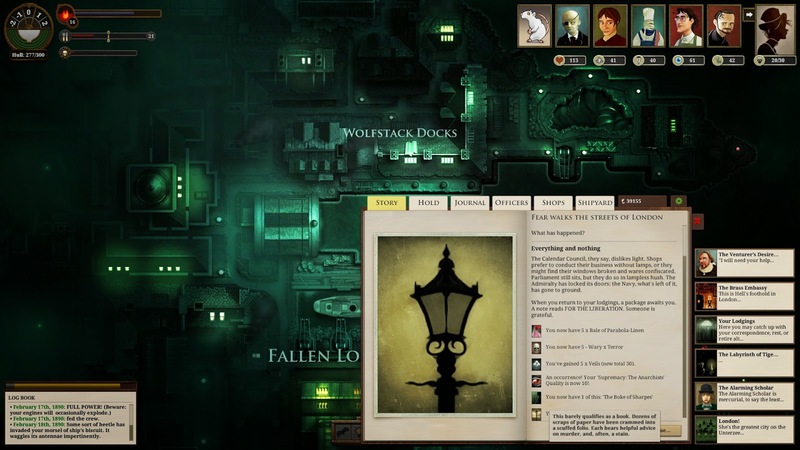 I basically fast-forwarded through the stages, dining with the Adventuress multiple times instantly after acquiring her even before leaving London, then immediately facing her assassins and pledging to help her find death. A single long voyage later, we were back at Abbey Rock, watching her face a worthy foe. Enigma in hand, I raced NORTH once again, stepped through the gate, and ended the game feeling elated. Like the Zeppelin ending, it's technically a loss, but it feels like a victory. I had earned a fair amount of echoes by the end of this game: I've maxed out the Heirloom storage of my Mansion, and still had something like 30000 echoes left over. Previously I had been selecting Iron and Hearts to carry forward my Memento Mori and Disillusioned Doctor. Once you have a nice set of cash, though, it seems much better to pick Veils and Mirrors, which lets you carry all of that money forward. I did that, skipped picking a background, and selected my ambition: Retire to a Life of Luxury. Sold off my starting goods, went to my Mansion, visited my Study, selected the option to Retire, and... that was it! I won the game in less than 60 seconds, having never once left London. I burst out laughing. After all of the days and weeks spent zailing, struggling, scrapping, losing, my first victory felt completely ridiculous. In the meta sense, I had earned it, but thinking of it as an actual story was really odd. "This is the story of a young woman, who wanted nothing better than to live in luxury. Fortunately, her mother had recently died, bequeathing her entire estate to her. The young woman never needed to work a day in her life, and lived happily ever after. The End." And... that's it! There are other, more interesting Ambitions in the game. 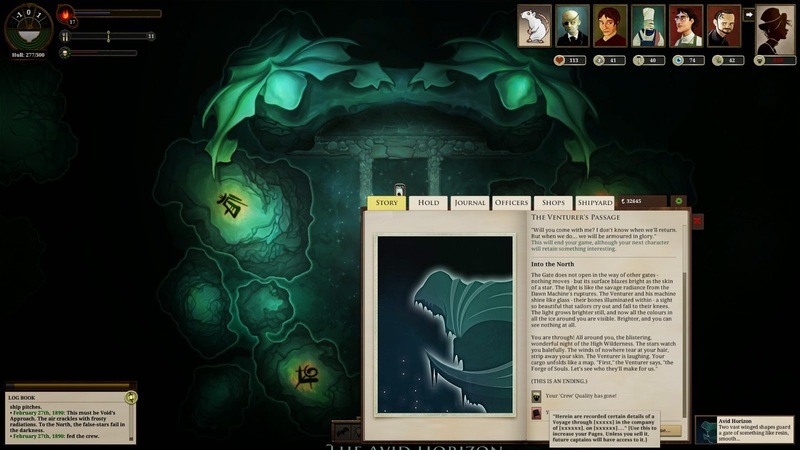 I've started a new game with the Father's Bones ambition, which already has an extra interesting story component to it. I definitely feel like the game should feel far more manageable from here on out, though. Between the beefy starting stats I've built up and the sizable purse each character can start with, I'm able to hit the ground running and start doing cool stuff pretty much from the start, without the fumbling I'm used to. I mentioned this in my previous post, but the company name Failbetter perfectly captures the experience of playing this game. You're expected to fail, and die, over and over again. But each time, you acquire tools that help you do better the next time. Some of these are mechanical in-game tools like Legacies; but the biggest of all is the mental capital you build up. Knowing what items you'll keep and which you can sell, which ports to prioritize visiting, how to navigate the various island plots... all of that hard-earned experience becomes incredibly valuable in subsequent games, and ultimately will lead you to victory.